This article assumes that your wireless adapter is already properly installed and/or enabled on the computer. Before trying to connect your wireless adapter to a Linksys access point, please know the following: SSID, Wireless Security and/or Network Key. If you do not know your wireless settings, click here. 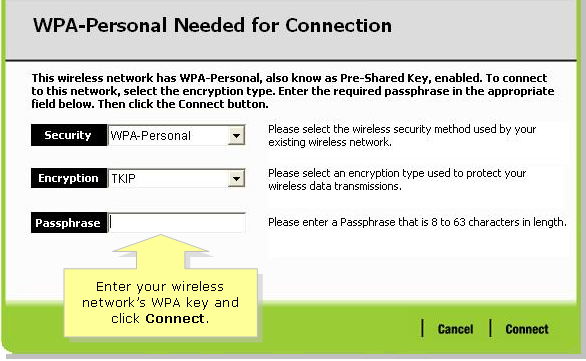 NOTE: To configure a wireless computer to automatically get an IP address automatically, click here. If you will connect a Linksys wireless adapter to the Linksys access point, click here. 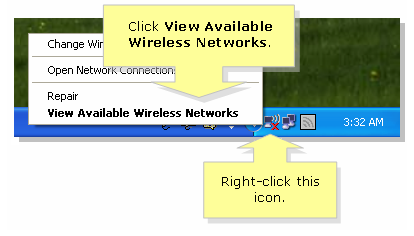 Follow the steps below to connect to your wireless network using XP’s Wireless Zero Configuration. 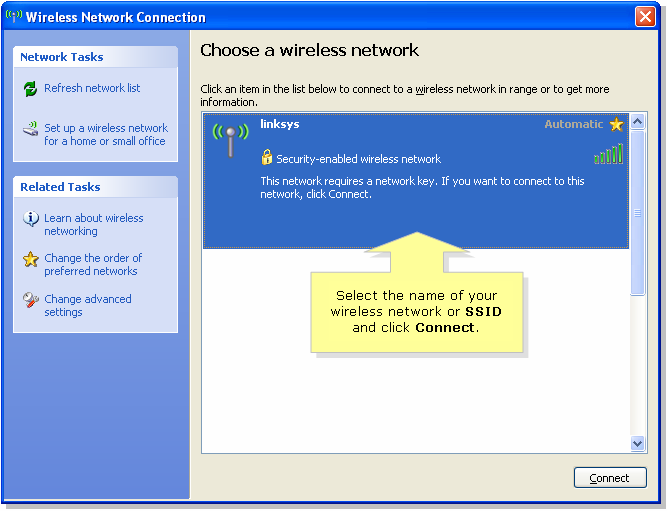 Right-click the Wireless Network Connection icon at the bottom-right of the screen and select View Available Wireless Networks. Select your wireless network’s name or SSID and click Connect. NOTE: If the wireless network's name or SSID is not listed, the SSID broadcast on the router is disabled. To connect to the wireless network with SSID broadcast disabled, click here. If the computer is not detecting any signal or is not seeing any wireless network, change the channel of the access point. For instructions, click here. NOTE: In this example 26 character key (128-bit WEP) was used. 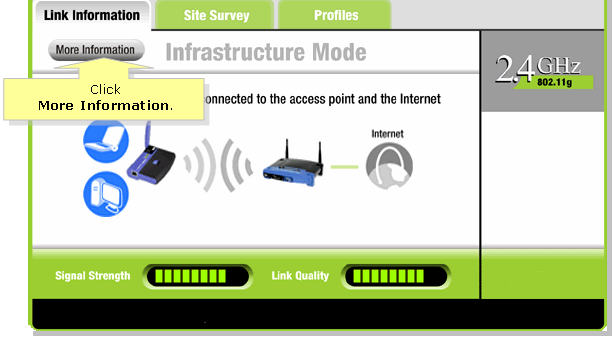 NOTE: The Wireless Network Connection icon at the bottom-right of the screen will turn green if the wireless network is connected. If you are encountering difficulties connecting to the wireless network, click here. For instructions on how to connect to a wireless network using Mac, click here. Click Site Survey and select the name of your wireless network or SSID, then click Connect. NOTE: The images may differ depending on the model number of the adapter. 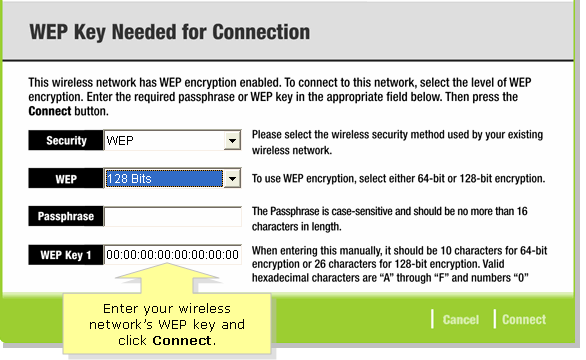 If the software is asking for a WEP key, enter the WEP key on the WEP Key 1 field and the WPA key on the Passphrase field. 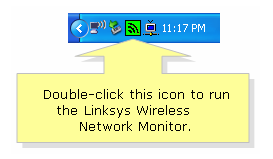 After the Wireless Network Monitor directs you to Link Information, click More Information. Click Save to Profile to save all your wireless settings.